I have made thousands of photographs of the places I’ve visited, especially along the old roads. Does that make me a documentary photographer? Probably. I’m not sure I care much about being labeled. But as I’ve shifted this blog’s focus to photography, I still want to write about the old roads and the places on them. For those posts to appeal to you photographers in the audience, I want to step up the quality of my documentary work. Additionally, I recognize that in so many of my photos from the road, I’ve focused either very narrowly, such as on a building or a bridge or their details, or very broadly on sweeping landscapes. Very little about my work would help you feel like you know something about the place or would recognize the place as you approached it. And that feels like a miss to me. 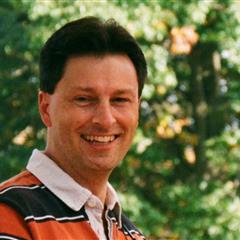 That’s where the label becomes useful: some accomplished photographers shot documentary work, and I can learn from them. 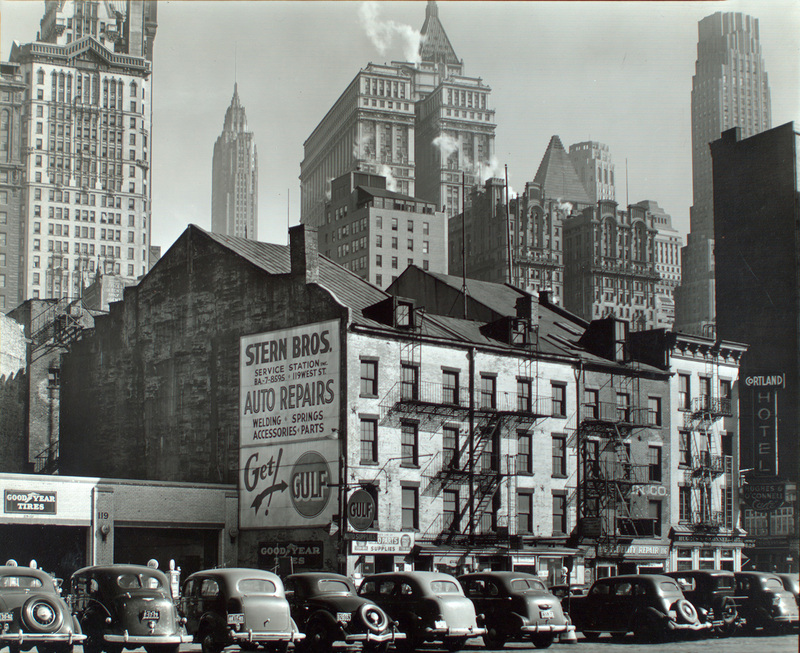 About the time I realized that, I came upon this 1938 photo of New York City by Berenice Abbott. It wowed me. Just look at all the great detail she captured there, in such an interesting way! It allows for detailed study of this place. Even though half of the street scene is visible only through the foreground sign, enough of it is visible that the photograph gives a sense of this place. If I could be transported to 1938 and dropped on the ground here, I would recognize it because I had seen this photograph. I have been to this place. It’s Columbus Circle, at 59th St. and Central Park West. Except for the statue in the center, it looks nothing like this today. But the statue and the shapes of the streets gives enough context for me to guess, probably correctly, that the street on the left is Broadway and the street on the right, visible through the foreground sign, is Central Park West. It certainly helps that Abbott got access to the right rooftop to make this composition. When I’m on the road I lack the connections that grant access to interesting vantage points — I’m relegated to the ground. But that doesn’t mean I can’t learn a few things from Abbott’s work that I can try in my own work. Back up and get in some context, especially if that context is interesting. So much of my work fills the frame with the subject. It’s a fundamental principle of photography. But does it always serve documentary photography well? Abbott’s work suggests that it does not. Just look at how seeing this building with the skyscrapers behind it communicates so much about the environment in which this building stood. Look for contrasting elements to make a compound subject. 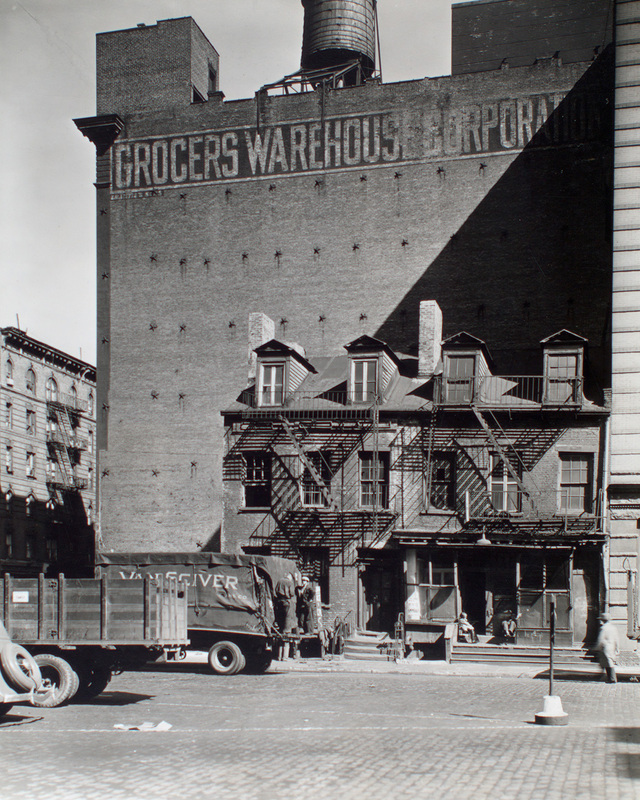 The low building is clearly from a different era than the warehouse building behind it. This composition gives a sense of 1930s NYC that filling the frame with the low building would not. Intersecting planes create interest. Three planes is a good start, but here Abbott managed to frame at least five: the building at right, the Brooklyn Bridge’s deck, the tiny bit of the bridge’s pier peeking out above the building, the building under construction, and the New York skyline in the distance. Photograph buildings at an angle to get a little life into the frame. When I photograph buildings, I tend to shoot them straight on and fill the frame with them. But over and over again Abbott approached buildings at an angle and showed some of what was going on in the spaces before them. This also gave her photographs depth. It helped considerably that Abbott shot a large-format view camera, giving her great control over depth of field and helping her heighten the sense of depth in her work. But I can adapt these ideas to my smaller 35mm and medium-format frames. Even when photographing detail, it can help the image to grab some context. The ornate building at right is Alwyn Court, which I also have photographed (see it here). 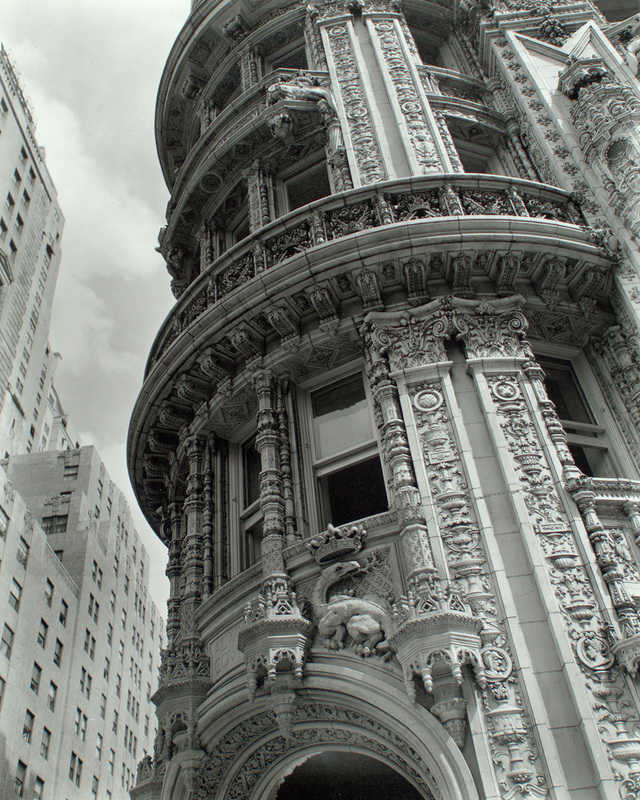 But I tended to focus on its details, and even when I photographed large portions of it I ignored the building’s surroundings. The buildings at left in this image heighten the viewer’s understanding of just how interesting and unusual Alwyn Court is. Seeing through is wicked cool. I saved this one for last because it is so interesting, but also because I have no idea how I might use it in my own work (yet). 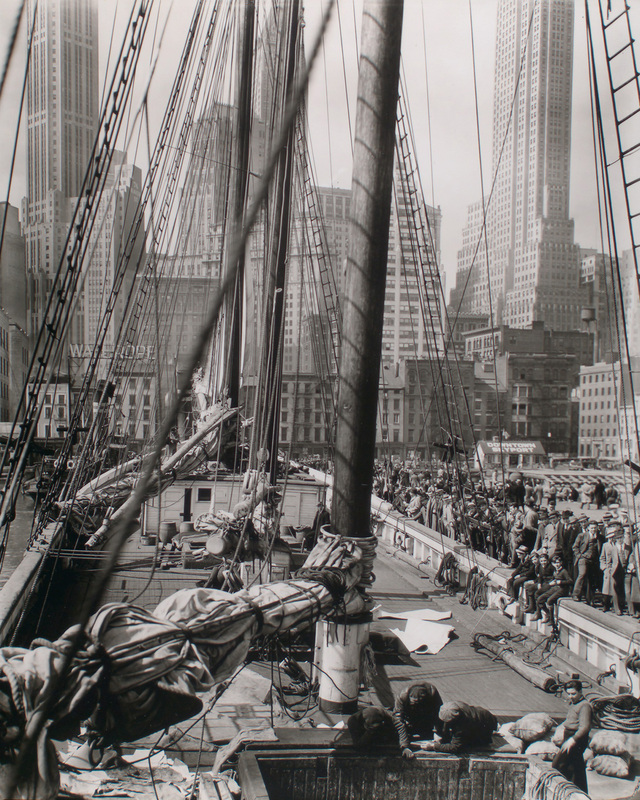 But seeing the New York City skyline through the masts and rigging of this ship gives a sense of really being there. Goodness, if I can help you feel like you’ve been there when you look at the photos I take of the places I go, I’ll have really accomplished something! Jim …. these are just the most interesting photos!! You can look at each one for a long time because there is so much to take in …. so much detail. Black and white photos are my favorite. 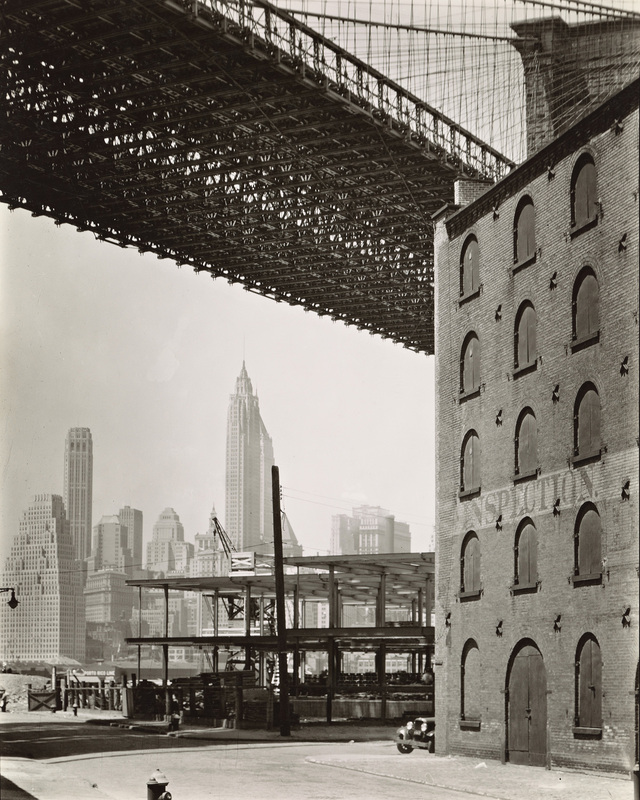 I’ve heard of Berenice Abbott before but not studied her work in any depth. I will do now though, the examples you’ve shared here are compelling, especially in showing all the contrasts between old and new. Also, anything you do as a photographer to improve your work is to be applauded, so well done on that score Jim. Yes, one of the things I’m fitting in here and there is looking at the work of acknowledged “good photographers” and seeing what I can learn from them. Absolutely something I want to do more of this year too – read about and see more of the work of the great photographers of the past. 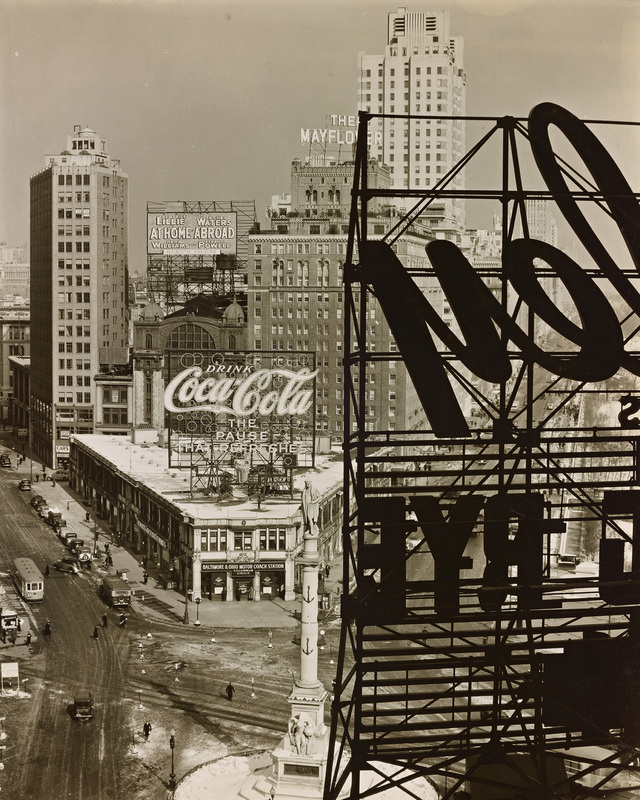 Thanks for the reminder to revisit Berenice Abbott. I re-read the interview of her this morning in a fine photo book by Margaretta K. Mitchel, Recollections:Ten Women of Photography. She did a lot of fine portrait work in Paris before the New York project. She made pictures of many well-known artists and authors, and I would guess she might have been comfortable with the idea of calling that collection of photographs “documentary” as well because of the way it captured the essence of those people in that time. How interesting, to consider Abbott’s portrait photography to also be documentary. Now I’ll have to go explore that work. I learned so much from this post, Jim! 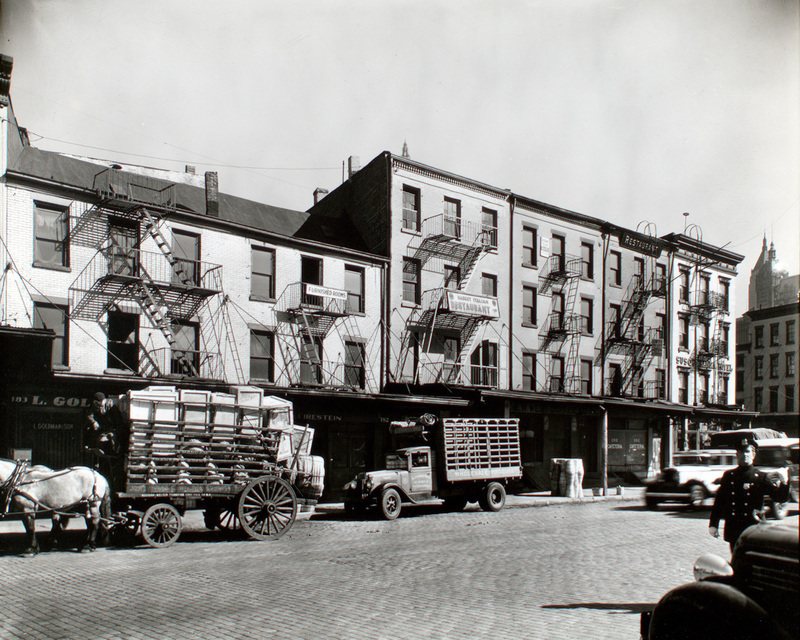 Thank you for this marvelous reintroduction to Berenice Abbott — and for the lessons you’ve gleaned from her images. Thanks H! This was my first experience with her work. It really did get my attention. Lately I’ve been thinking about documenting the city where I live. The Olympics will be here next month and the city has already changed a lot in preparation. (It’s the Pyeongchang Olympics, but Pyeongchang is a little town with some ski resorts. All the ice sports are in next-door Gangneung, where I live). I tend to focus on details and not the big picture. I’m also learning how to pull back and photograph the environment but it’s not easy. It’s something I have to force myself to do because I’m so interested in the odd little details you find in this place. The other day I managed to get up on the roof of the Central Market but there was no view worth photographing. There were some drying fish hanging from the air conditioning fan units though, so I photographed those. That really is the trick, isn’t it: pulling back and finding the interesting composition. It’s not always there. And sometimes it’s there and we just can’t see it. I loved this post. Engaging, well-written, fantastic images.